Let’s start with a rough estimate. One habitual thru-hiker estimates having seen at least 70 water and food caches on the PCT. These outposts of civilization are increasing at a rapid rate. There are a slew of problems associated with them, and the PCTA is committed to finding solutions. In other places, we have addressed the issue of unattended food and beverage caches. A 12-pack of beer left in the wilderness may be fun and refreshing on a hot summer day. But it’s another encroachment on the wilderness that needs all of our protection. Bags of candy stashed in trees from Mexico to Canada may be morale boosters, but they also harm wildlife and starkly interrupt the natural setting of the trail. Because people need water to live, water caches inherently are a more complex issue than coolers of treats. Water can be viewed as a safety issue, and caches of water can be seen as necessary safety nets. People placing such caches undoubtedly have their hearts in the right place. However, we’d like to present the case that water caches, especially in the large numbers they appear today, in effect make the trail less safe. The trail is not supposed to be easy. It was not long ago that there were no caches on the PCT. It was a wilder, rougher time. Self-reliance was paramount. A traveler had to look closely at information sources, carry lots of water and hike or ride one’s horse sometimes dozens of miles between reliable water sources. It was tough, especially if the water was off trail and out of the way. The feeling of successfully having met those challenges was, and is, one of the greatest rewards the trail can offer. The PCT presents an intense physical and mental challenge in primitive backcountry landscapes. The trail is not supposed to be easy. It has long dry stretches that are well documented. A person can either choose to avoid these areas or carry enough water to get through. One of the most cherished experiences the trail provides is the sense of personal accomplishment gained through careful planning, problem solving and self-reliance. Primitive travel and survival skills are not part of the skill set of the average modern civilian. They are something of which we earn the right to be proud. The opportunity for that experience changes when water caches become commonplace. There are, admittedly, a few exceptionally long dry stretches that warrant a solution, and water caches may be an appropriate stopgap. There are about four of these locations: two in Southern California, one in Northern California, and one in Oregon. What concerns us are the dozens of road crossings with water caches that aren’t in long dry stretches. Some of them are actually very close to a natural water source. We’ve dealt with caches placed less than a quarter mile from a spring or stream. As new people find out about the Pacific Crest Trail, more and more of them want to help out by placing caches. It’s a kind-hearted act meant to prevent emergencies and even save lives. Judging by the number of calls the PCTA receives of offers to place water, there’s a constant stream of new people who want to help out in this way. But let’s face it: What’s evolved on the PCT are caches for convenience, more so than for emergencies. Water so that you don’t need to hike to an off-trail source. Water so you don’t have to carry a heavy pack. Water so you don’t have to plan and be self-sufficient. 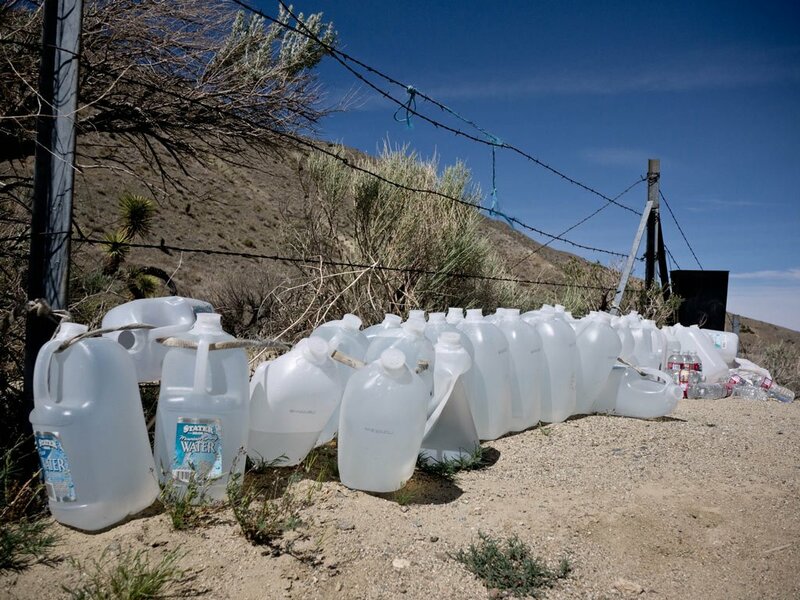 You may have heard it repeated in hiker circles: Never rely on water caches. Plan as if they are not there. Carry plenty of water between reliable water sources. Your safety depends on your self-sufficiency. However, with the proliferation of water caches, fewer are heeding this advice simply because they don’t have to. Decreasing wildness: The PCT offers a unique opportunity for primitive travel. That’s a large part of why the trail exists. Overdone trail magic is no longer magical. When it becomes commonplace, it changes the trail experience, driving it further away from the purpose for which the trail was intended. Decreasing hiker preparedness, in turn making the trail less safe: It’s deeply troubling how common it is for newcomers to assume that a cache will be full. You’ll be in big trouble if you arrive at a cache, 10 miles from the nearest water, and it’s empty. Too many learn this lesson the hard way. 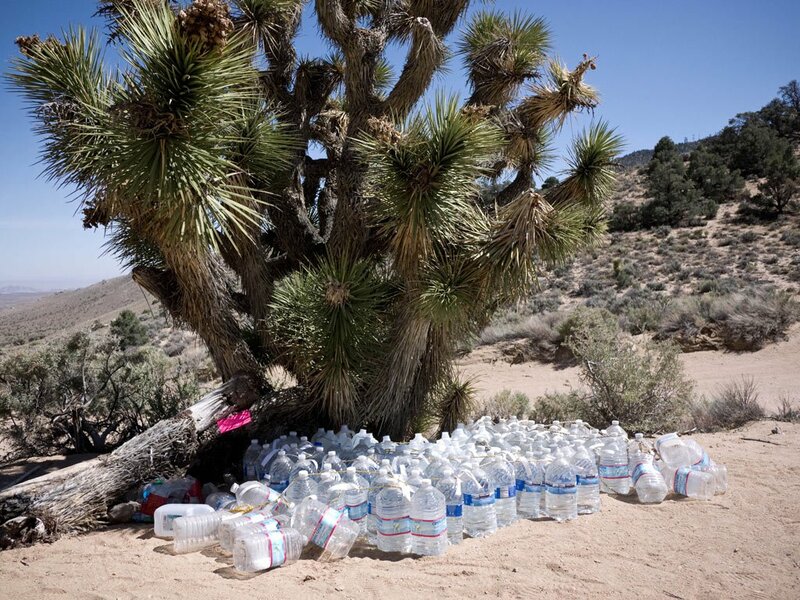 Trash and the relics of town collect around caches: Hikers irresponsibly leave behind the trash from their packs, believing that volunteers who steward the cache will truck it out. Volunteers in turn bring couches, tables, chairs, carpets, coolers, decorations and other amenities for fun and comfort. On the other hand, many caches are rarely maintained, if at all. Plastic bottles blow away. Styrofoam coolers disintegrate. Caches end up looking like garbage piles. Caches become camps: Too many trail users see cache locations as convenient stopping points, and they create high-density disturbed sites. They trample bushes and build new fire rings in the fragile desert landscape, where they are illegal and inappropriate. Cache locations are unstudied: These unofficial trail facilities have real impacts. 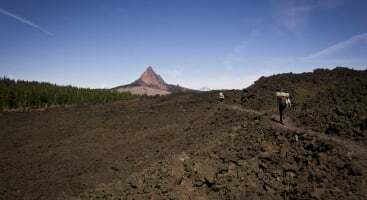 Development of facilities on the Pacific Crest Trail should be kept at a minimum necessary number, be of clear benefit and carefully considered. Before something can be built on public land, important studies are conducted to ensure that rare or endangered species or historical sites are not disturbed. This protects special places and resources. Caches are often illegal: Laws are in place to prevent the general public and private businesses from haphazardly building things and storing stuff on public lands. If these rules didn’t exist, our wilderness would be cluttered with all kinds of stuff. Caches harm wildlife: Where water is left, so is food. These well-meaning treats are a magnet for bears and other wildlife, putting them in danger of eating something that will make them sick or worse, having to be killed if they become a nuisance to communities along the trail. If you are a hiker, we urge you to make your water plan without any reliance whatsoever on water caches. If you’ve thought of placing a cache, we urge you to find a different way to join in the magic of the PCT. Such passion is needed and welcome in other ways. Volunteer for a work party to help clear brush and fallen logs, curb erosion, and keep the trail in useable condition. Not your thing? The trail also needs logisticians, computer geeks, cooks, advocates, artists and all manner of help. Your passion is also needed in the universal currency: Your donations are a fantastic way to express support for the future of the PCT experience. If your goal is more to cheer on the hikers, or to simply be a part of the social experience, perhaps just go on out to the trail and say hi. Offer help to people in person. Cookies, a laugh, perhaps even a ride, are welcome. Show up, or call a business in a trail town and offer to buy a beer or a meal for a thru-hiker. Or find another way to touch the travelers’ journey that leaves no trace of you remaining on the trail itself. For years, the PCTA, federal land managers and passionate local partners have been facing challenges with the biggest problem caches. Caches have been removed, cleaned up, considered and debated. The PCT was designed and intended to be routed close to water, but what frequency is sufficient? The PCTA and the U.S. Forest Service have maintained springs to keep them flowing. We have encouraged partners to fill remote fire-fighting tanks (which costs considerable money) so that hikers can use them. What’s the right length for a waterless stretch? How easy should the PCT be? These are hard questions that we are struggling with. Clear choices are not always apparent. And there are other factors to consider. ”Reliable” water sources can go dry – years of drought have proved that. There are also other pressures on the trail as use increases, which has been happening for years. The popularity of the PCT means we need to look closely at camping impacts adjacent to natural water sources, especially those that are few and far between in Southern California. In doing so, our goal should be to spread out camping more evenly along the trail, not to divert concentrated impacts to the surrounds of artificial caches. Instead of camping at a water source or water cache, we encourage long-distance travelers to fill their water containers and keep going. Many of the most scenic, durable and memorable campsites are waterless. Dry camping takes pressure off fragile riparian areas. Further, by camping out of sight of the trail, you’re sure to find solitude while increasing opportunities for others’ solitude as well. It’s a great way to leave no trace and preserve the trail experience. The PCTA, the U.S. Forest Service and the Bureau of Land Management have a renewed focus on finding long-term solutions to the longest stretches without water. Our Regional Representatives are working with local agency partners to examine the longest of the dry stretches, such as the four mentioned above. If necessary, water systems such as large water tanks and wells might be in order. We’re also looking into how to provide better information about water sources that may be off trail and often passed by. All solutions should be sustainable. Grossly expensive and fragile water delivery systems – especially ones that put too much pressure on scarce volunteer, staff and agency resources to maintain – are not ideal. We’ll also be working with our agency partners and trail maintenance volunteers to remove problem caches when appropriate and necessary. Our goal is to work deliberately and collaboratively with the PCT community to make sure our choices are proper and sustainable. This is not something we can or should do overnight. A key piece of this work over time will be to continue to educate hikers and riders. The PCT is a wilderness trail. To do it, you need to be physically fit, well prepared and self-sufficient. Not all sections are suitable for all people. To get water from reliable sources, you might need to go into town or off trail. Never rely on water caches. This is one of the ways in which we preserve the wild character of the PCT. For more, please read our water issues page.